Food – Roast Duck with Spice rub and Madeira gravy. Just the right amount of structure without firm tannins to enhance the heat and spice of the rub. 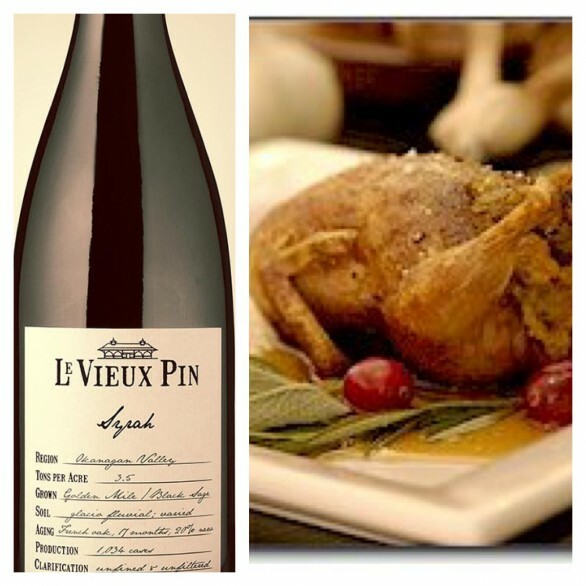 Earthy, pepper and savory tones in the Syrah complimenting the earthiness of the Duck. At least 24 hours before serving, mix the salt, pepper and herbs, except the thyme sprigs, in a large bowl. Add the duck legs and rub in the herby salt until well coated. Cover and leave overnight or up to 24 hours in the fridge. On the day, preheat the oven to fan 180C/ conventional 200C/gas 6. Remove the duck legs from the fat and wipe away any excess with kitchen paper. Put the duck on a wire rack in a roasting tin and top each leg with a sprig of thyme. Roast for 10 minutes, then add the Creamy wild mushroom potatoes to the oven (see recipe, below) and cook with the duck for 30 minutes, or until the duck skin is golden. Meanwhile, reheat the cabbage and gravy in separate pans until piping hot. To serve, put a generous spoonful of cabbage on serving plates and sit the duck legs on top. Spoon round the gravy and serve with the potatoes. For a green vegetable, quickly stir fry some sugar snaps.